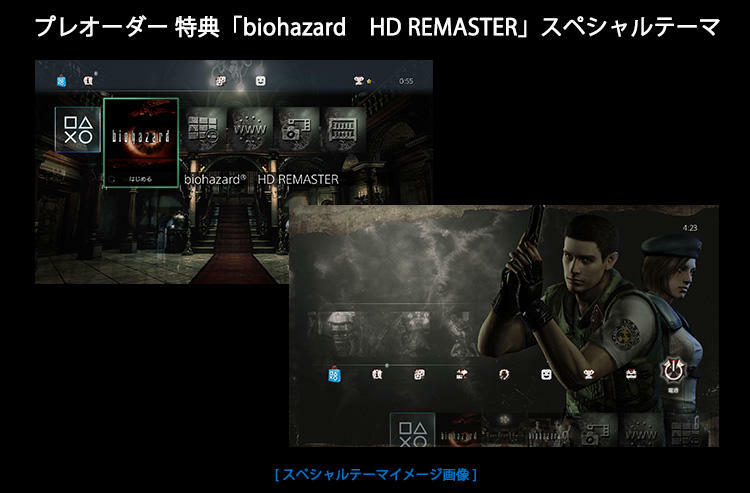 Resident Evil Zero HD Leaked by Capcom? We’ve already got two Resident Evil games coming out this winter with Resident Evil HD Remaster lined up for a January release and Resident Evil Revelations 2 coming out in February. Should we be expecting a third? In an update on the Resident Evil HD Remaster website, Capcom has uploaded some images of the pre-order theme you’ll be getting with the PlayStation 4 Japanese version. Included in this theme is a special icon for Resident Evil Zero hinting at a possible re-release of the GameCube original. For what it’s worth, Resident Evil Zero is kind of the odd child of Resident Evil’s little love affair with Nintendo back in the GameCube days. It wasn’t as widely loved as either the Resident Evil remake or Resident Evil 4, but it had some creepy scenes in its own right. It is best known allowing players to switch between two different characters during the campaign. Both convicted soldier Billy Coen and police medic Rebecca Chambers bring with them their own special abilities, similar to what we’ve been seeing from Resident Evil Revelations 2. Again, I am only briefly familiar with this chapter of the franchise. Like most pre-Resident Evil 4 games in the franchise, the tank controls turned me off to what is probably a decent horror game buried underneath. If Capcom’s remake team was to apply all it’s learned from remaking the original for a modern age, ie. giving the option for normal controls, I would be okay with giving this one a shot as well.